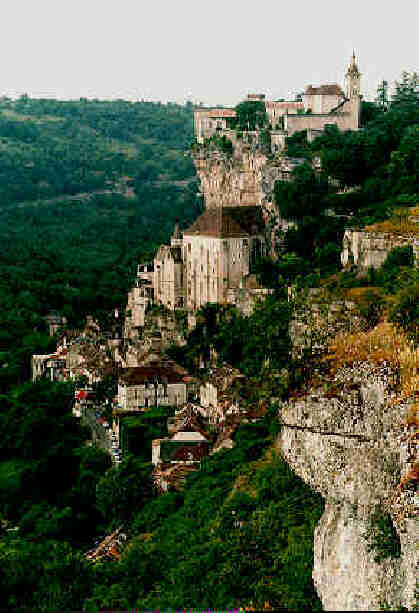 Twenty minutes drive from Nadal you will find Rocamadour, among the premières sites de France . Perched high on its cliffs overlooking the Alzou Valley, Rocamadour has a long and distinguished history in Christendom. Site of numerous miracles from the 12th Century onward, Rocamadour gained distinction as both a destination for penitents and a way-station for pilgims on the route to St. Jean de Compostel in Spain. One of the first pilgrims to Rocamadour was Henry Plantagenent, King of England, who was miraculously cured as he paid hommage to the Vièrge noire of Rocamadour. Other famous penitents and pilgrims to visit Rocamadour during the Middle Ages included Saint Bernard, Saint Louis, Blanche of Castille, Philippe IV, Philippe VI, and Louis XI. Many less distinguished citizens were sentenced by ecclesiatical courts to make pilgrimige to Rocamadour. Typically, the penitent would end his arduous voyage to Rocamadour by stripping to his skivies, donning heavy iron chains and collar, and then climbing à genoux the several hundred stone steps leading to the chapel housing the miraculous Black Virgin. A view from the top of Rocamadour.